Sophomore right wing Austin Goldstein’s first goal of the season, coming on a breakaway 4:15 into overtime, gave the third-seeded Northeastern University Huskies a 2-1 victory over the sixth-seeded University of Maine Black Bears in the first game of their best-of-three Hockey East quarterfinal series at Matthews Arena in Boston on Friday night. Northeastern (24-10-1) can advance to the Hockey East semifinals with a victory Saturday night at 7. If UMaine (15-16-4) wins, a third and deciding game will be Sunday night at 7. It was Northeastern’s third straight win and eighth in its past nine games. It was the fourth time in five games UMaine has been held to two goals or fewer. Tyler Madden staked NU to a 1-0 lead off a Lincoln Griffin assist 8:29 into the second period. It was freshman center Madden’s 11th goal of the season. But UMaine defenseman Brady Keeper got the equalizer 7:51 later with each team skating a man down. It was his seventh of the season, and it was unassisted. Keeper now has two goals and three assists in his past four games. Sophomore Cayden Primeau, one of 10 finalists for the Mike Richter Award that goes to the country’s best Division I goaltender, finished with 41 saves in running his career record against the Black Bears to 5-0. He has given up nine goals and made 140 saves for a career goals-against average of 1.80 and save percentage of .940 against the Black Bears. UMaine sophomore Jeremy Swayman made 30 saves and is still looking for his first win against the Huskies. Goldstein’s second goal in 46 career games came off a UMaine turnover. 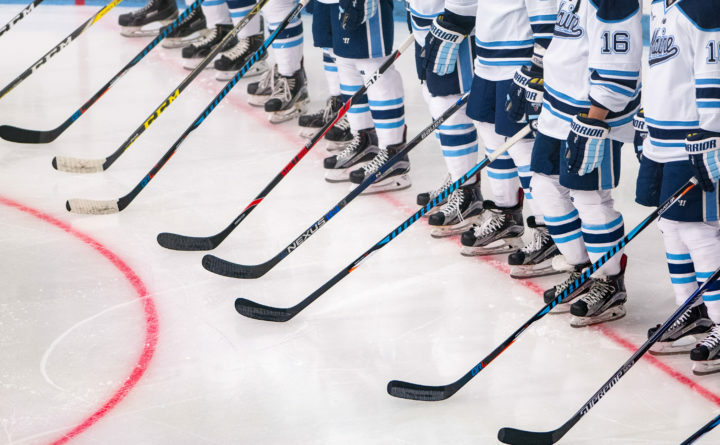 “We tried to make a pass at the blue line and it hit a skate and bounced [to Goldstein] and he went in on the breakaway,” UMaine head coach Red Gendron said. Goldstein entered the game with one assist in 20 games this season, and one goal and six assists in 45 career contests. Gendron said his team turned in high-quality performance. “Swayman played great, our team played great, but it wasn’t enough. We have to find a way to give more tomorrow,” said Gendron, whose Black Bears outshot NU 5-2 in overtime. “Their goalie played well. We had the better of the play. I couldn’t ask our kids to play any harder or do a better job following the game plan. It was a good college hockey game. We came up short and need a little more execution [on Saturday],” he said. After Madden opened the scoring, Keeper tied it up by skating through the middle of the ice and blasting a slap shot past Primeau. Northeastern went 0-for-4 on the power play, while UMaine failed to convert on its only power play opportunity and has now gone seven games without a power play goal.